USAID and NREL are supporting Peru's Ministry of Energy and Mines to understand the business case for distributed PV across Peru under the current regulatory framework. In partnership with USAID and the Ministry of Energy and Mines (MINEM), NREL created the Peru Renewable Energy Data Explorer tool to help analyze solar energy opportunities in the country. This interactive mapping tool contains high resolution data for solar and wind resources and analysis tools that will enable MINEM officials to accurately represent Peru’s renewable energy potential in future power sector development policies and renewable energy targets. An analysis of diesel energy use in Peru Sur: this project is examining the potential of the Peru Sur region to offset increasing diesel generation with solar energy. The work utilizes NREL’s System Advisor Model (SAM) in order to model the performance and costs of potential solar energy projects in the region. Modeling of islanded power systems: NREL in collaboration with MINEM has been gathering data in order to model the power system in Iquitos. The work is helping MINEM determine potential development pathways for the system in Iquitos and how renewable energy generation can be used to offset rising diesel generation. A review of MINEM regulations and technical assistance: NREL will be providing comments on MINEM’s draft regulations for distributed generation resources and working with MINEM officials to determine next steps to consider in their evolving renewable energy regulatory environment. NREL will also be providing expert analysis and comment on changes underway to firm capacity and the hourly block model in Peru’s energy market. To learn more about the role of firm capacity (or capacity value) in meeting electricity demand see this factsheet. To learn more about the role of hourly and sub-hourly dispatch on grid flexibility see this factsheet or watch this webinar. 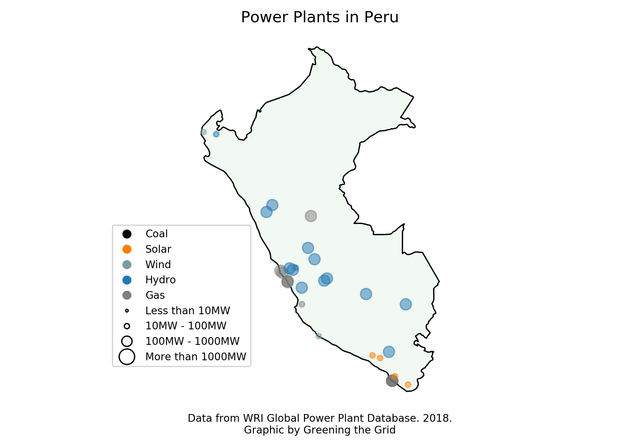 The map below shows the location, type and size of power plants operating in Peru.